BURNABY, B.C. 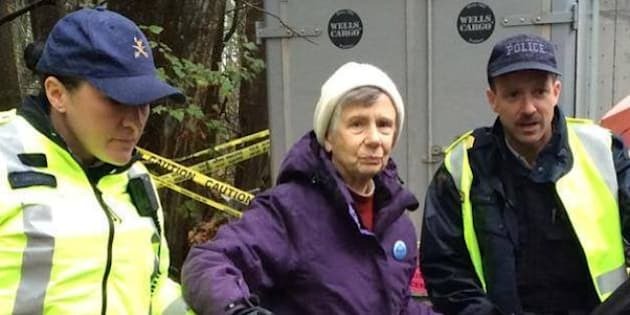 - An 84-year-old retired librarian says she's willing to violate a court injunction and go to jail as she and other anti-pipeline protesters take a stand against fossil fuels by interfering with survey work in Burnaby, B.C. Barbara Grant joined activists near Burnaby Mountain on Tuesday to demonstrate against Kinder Morgan's proposed plan to nearly triple its pipeline capacity to transport Alberta oil to British Columbia. Grant said she has the support of her three children and three grandchildren, some of whom have joined the protest as crews drilled two bore holes into Burnaby Mountain before a decision on the project by the National Energy Board. "They believe, as I do, that this pipeline must be stopped," Grant said of her family's views on the Trans Mountain pipeline project, noting crews were working on public land. "I believe that this pipeline is a very, very bad idea," she said. "It goes against practically everything I believe in. And I feel that the National Energy Board process by which the Kinder Morgan cause is being advanced is totally undemocratic." Grant said protesters had gathered about a 10-minute walk from the site where crews were doing survey work and that she may cross a no-go line on the mountain later Tuesday. She said the risk of being arrested would be worth it to make a point against the expansion of the Trans Mountain pipeline. "That is a possibility I have to face," she said. "For one thing, there's the extremely important issue of fossil fuels and climate change," she said. When it comes to the transportation of oil, B.C. is taking all the environmental risks, she added, raising concerns about increased tanker traffic and the threat of an oil spill. "The financial benefit is all for Kinder Morgan and those who have money invested in the oilsands. But there's very, very little benefit to B.C.," Grant said. "B.C. is just being used as an area through which the oil has to be piped in order to send it to Asia." Grant's stand came on the same day that an application by Trans Mountain was filed in B.C. Supreme Court asking to extend the injunction deadline from Dec. 1 to Dec. 12. The document states the protests have delayed Trans Mountain in finishing its field studies and it isn't responsible for that delay. "It is in the interests of justice that the terms of the order be extended for a short period of time to permit Trans Mountain to complete the mandated field studies that it has undertaken ... and the expense and inconvenience already incurred," the document states. "Completion of the work will serve to mitigate the damages suffered to date." The National Energy Board announced Tuesday that it will launch a tour early next year in an effort to strengthen pipeline safety. Peter Watson, the federal regulatory agency's chairman, said board members and staff will visit every province and the North to hear Canadians' views on how it can improve its pipeline safety program and they will issue a report by early 2016. The Trans Mountain expansion proposal has triggered protests from several groups, including Burnaby Residents Opposed to Kinder Morgan Expansion, or BROKE, though Grant said she's not part of any group. Some First Nations have also expressed anger over Kinder Morgan's $5.4-billion plan to expand the existing line linking Alberta oilsands to the company's tanker terminal on Port Metro Vancouver. On Monday, a First Nation elder told an NEB hearing in Victoria that the proposal threatens traditional hunting, food sources and archeological sites. Simon Smith said his band, the Tsartlip people of southern Vancouver Island, support protesters against the survey work on Burnaby Mountain. At least 78 people have been arrested since last week, and most of them have been charged with civil contempt. A B.C. Supreme Court judge has already dismissed an application by the City of Burnaby for an injunction against survey crews on Burnaby Mountain, Kinder Morgan's preferred route for its Trans Mountain pipeline.